If you would like to track the status of your South Korea visa application, there’s a visa portal where you may do so. If you’ve applied for a South Korea visa through a designated travel agency in the Philippines or directly to the Consulate office in Cebu, chances are the waiting game is killing you. 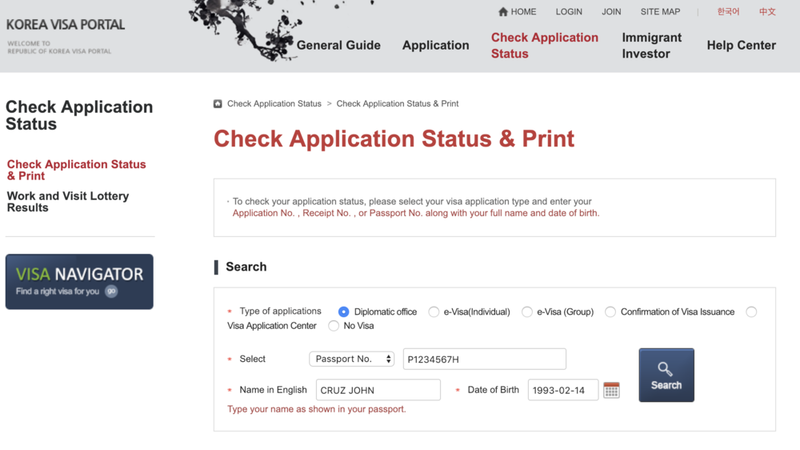 It’s a good thing that there’s a way for you to check the status of your Korean visa application via the Korea Visa Portal. Do note, however, that the data to be shown by the Korea Visa Portal may not be updated real-time, so don’t be too anxious. Click on this link and translate the page to English. You can do this by simply clicking on English at the upper-right handside of the window. Once translated, the website should look something like this. On the sidebar on the right, hover over Check Application Status. You will then see a text that reads Check Application Status & Print. Select this option. Here’s what it should look like once you’ve filled it out. Refresh the page from time to time, and you might find your Korean visa application status change from Application Received to Approved. Just go and be easy on your checking. Actual screenshot of my search result from Jan. 10, 2018. Personal details were changed for privacy. You did not follow the format when inputting your name, date of birth, or passport number. You’ve probably checked too soon. Your chosen travel agency that’s designated to process your visa application has not submitted your requirements yet. You may check the list of OECD-member countries here. Whatever the result of your South Korea visa application is, stay positive! For more travel guides and tips, like ManilaxSeoul on Facebook.